A seasoned academician,an experienced technocrat and an able administrator with more than four decades of active involvement in the field of education. 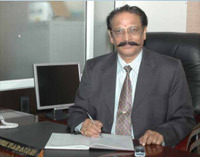 Founder Vice-chancellor of the well-known Visvesvaraya Technological University of Karnataka. Mainly responsible for introducing the dual degree concept in Visvesvaraya Technological University, Karnataka. Actively associated with various National and Multinational companies in providing technical advice for constructive projects. Has extended valuable services to various technical and non-technical Government organizations and NGOs. As Director of CDGI, he developed it into one of the best technical institutes in Indore, within a short span of 4 years. Mainly responsible for implementing the concept of Orientation Programs for students and Faculty Training Program for the staff. A strong advocate of a meaningful Industry-Institute-Interaction and instrumental in getting some of the top executives of multinational companies to interact with the students. He has initiated the process of having academic interaction with reputable Universities in Singapore, West Germany and USA.